First of all, I want to apologize for being such a bad blogger! I do have a pretty good excuse though - we just got back from a trip to Disneyland! We surprised the kids a week ago Sunday. They had no idea we were even going away! We had so much fun. Their favorite part was meeting the characters and getting their autographs. It appears that we picked a good week to go because it started snowing the day before we left and continued for a couple days. It was gorgeous in California! We even spent a couple days at the beach! All of this comes packaged in a craft keeper for only $32.50 (CDN) (before shipping & GST). This is Stampin' Up! 's first Canadian only philanthropic campaign so lets take advantage of this great opportunity to raise money for Big Brothers Big Sisters of Canada! You can check out the Loonies for Littles flyer here. To give you some ideas of what to do with your kit, I will be featuring a different project each week, from now until the end of May, using products from this kit. 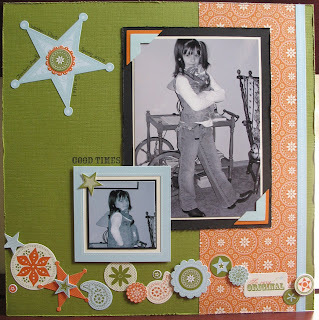 This weeks project is a scrapbook page featuring my daughter during Western Days at school last year. Supplies: contents of Loonies for Littles kit as explained above; photo corner punch and cutter kit.